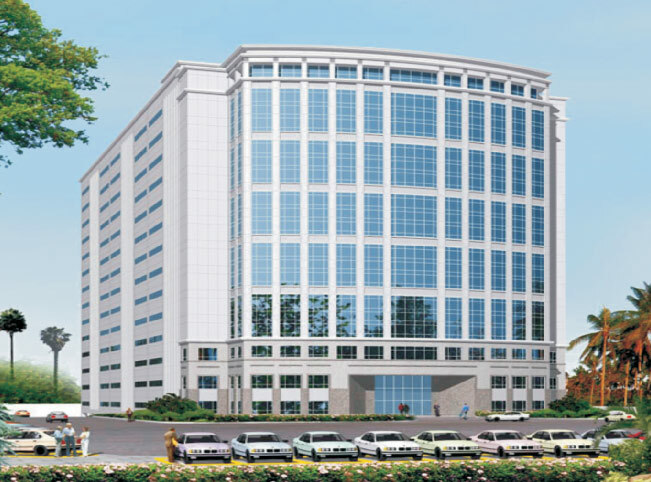 Right on the old Mahabalipuram road or the IT Expressway, the fast-emerging IT Corridor in the country - Just 2 km. from TIDEL Park and the MRTS Rail station - close to the National / International Air terminal and provides for an enchantingly-serene work atmosphere. Plot Area -	187920 sq.ft. Floor to Floor height	-	3.85 Mtrs. Floor to Ceiling height	-	3.55 Mtrs. Total height	-	60 Mtrs. Typical Column spacing-	10 Mtrs x 11 Mtrs. CCTV and PA system. Electrical control panel / fire panel integrated in BMS System. Toilets	- Brick wall panel with concealed water lining as per IT standard. Maximum travel distance from the working spot to Fire escape stair 25 Mtrs. Dedicated UG Sump - 4 lakh ltrs. capacity for Firefighting system. 4 lakh ltrs. UG sump and 3 lakh ltrs. OHWT. Power supply - 33 KV HT power supply from T.N.E.B. 14 Nos of 'Mitsubishi' Elevators of 16 passengers capacity each and speed of 1.75 Mtr. per second. 2 No. of Service lift of 'Mitsubishi' Make of 20 passengers capacity and speed of 1.75 Mtr. per second. 4 nos of AHU units in each floor. 2 nos of 50 TR and 2 nos of 32 TR. Bio metric access control in 3 levels.